So, there was a certain point during the testing of tuna recipes for our last contest that we became confused. Baffled. Stricken with bewilderment. And it came immediately on the heels of trying this recipe. But more on the confusion later. Right now, all you need to know is that this recipe is from Eartha Kitsch’s mom, Opal, and is from Better Homes and Gardens New Cookbook from 1976. 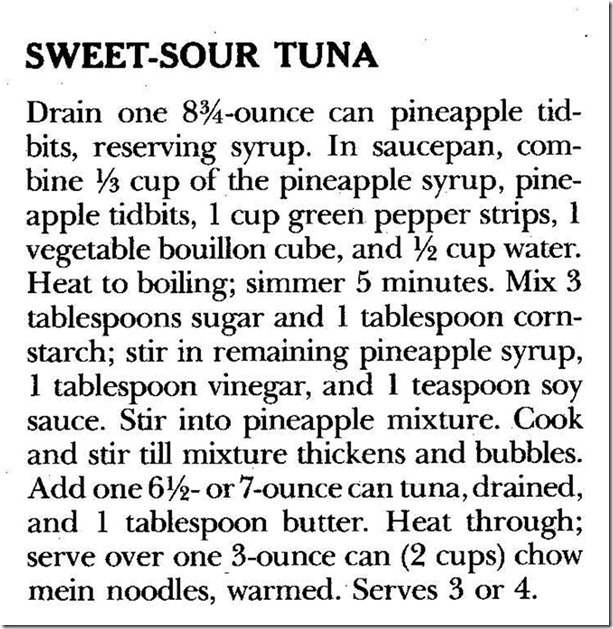 And IT is Sweet-Sour Tuna. This recipe is the greatest because you don’t serve the tuna over rice or noodles. Oh no, that would be boring. Instead, you serve it over crispy fried chow mein noodles! God, sometimes I LOVE the 70’s! 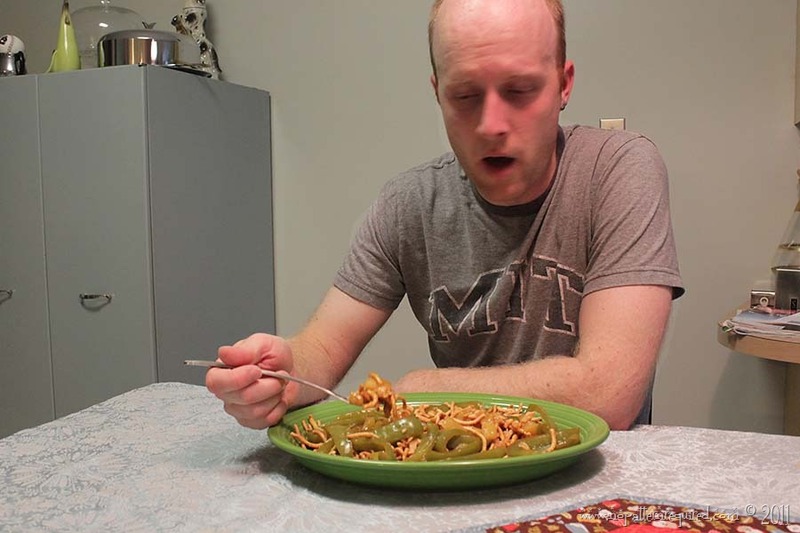 Now, I’ve eaten a lot of chow mein noodles in my lifetime. 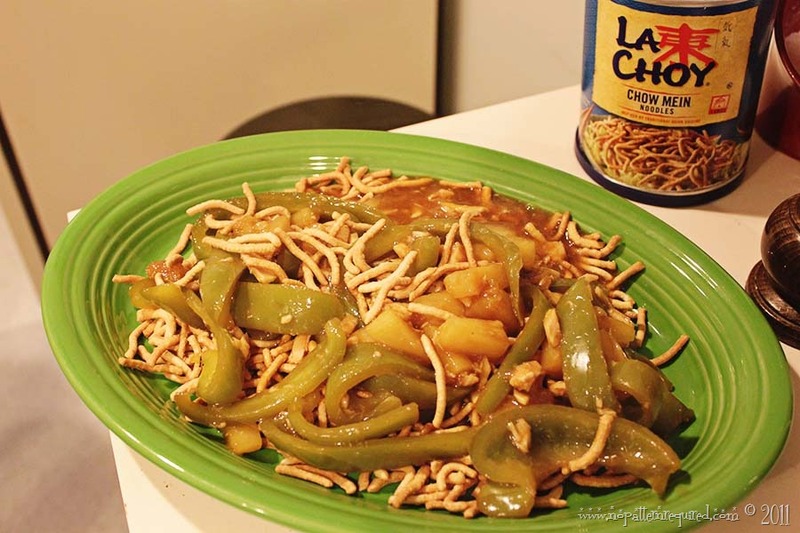 Sprinkled on top of cans of La Choy chop suey. Thrown in chicken soup. Eaten in cookies. 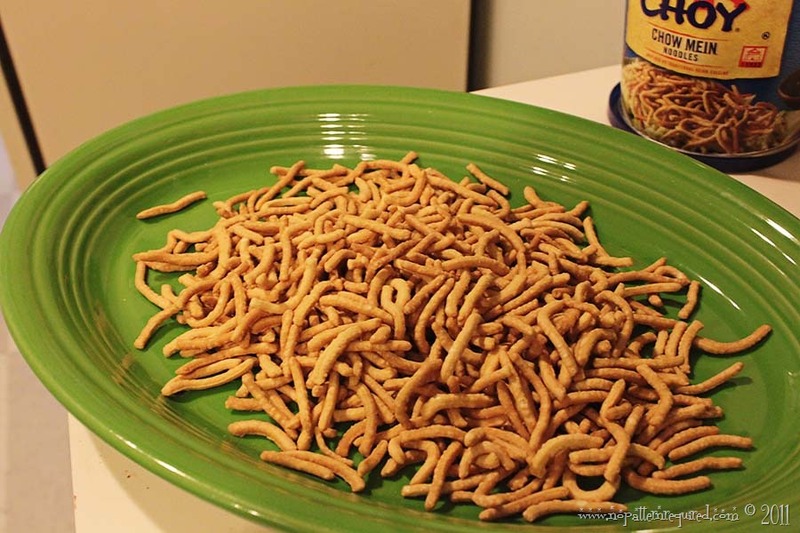 Heck, they’ve even been a snack a few times when I was desperate. But I’ve NEVER used them in place of rice. Has anyone ever done this? Ever? Is this some glorious culinary time period that I missed out on? But no worries. 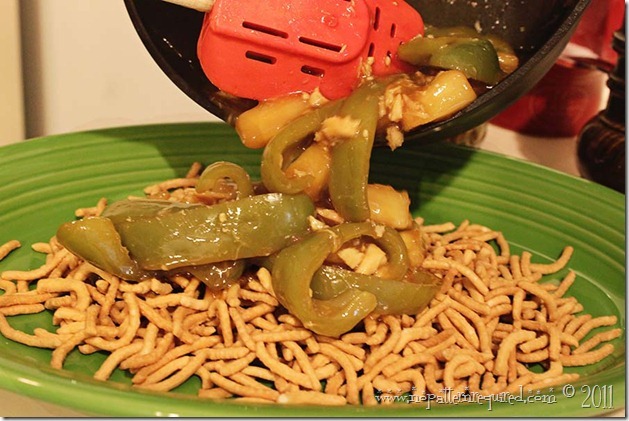 Because using chow mein noodles instead of rice is BACK! At least at our house. Too bad I had to put tuna garbage over it. 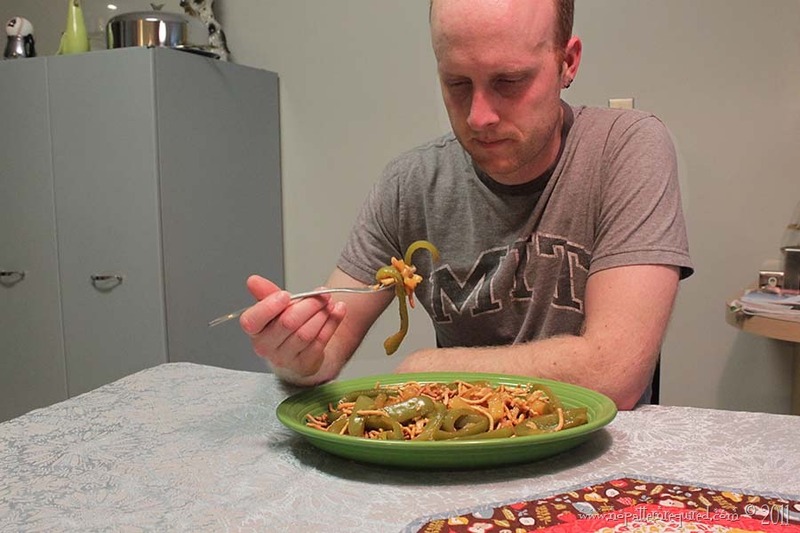 He didn’t even want a plate. He was so sure it was going to be awful, that he didn’t even bother with it. “What the-” I threw down the camera (“Careful”!”) grabbed the platter and snatched away his fork. I scooped up a huge bite and stuffed it into my mouth. The Verdict: GOOD! I know what you are thinking. How? HOW!?!? But it was, in a fake-Chinese way. The best part was the pineapple and the green peppers with the chow mein noodles. You couldn’t even taste the tuna. Which…now that I think about it…might have been why it was so good. Okay, NOW we can address our confusion. What the heck? HOW could this possibly be good?!?!? How? 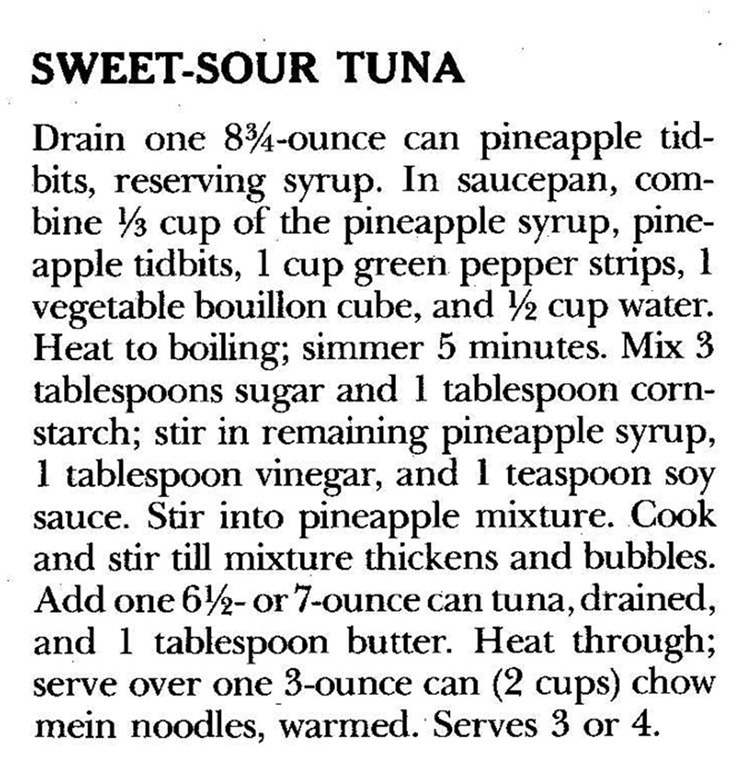 We were mightily confused, because this was the latest in a LONG string of tuna recipes that I thought would be bad but actually turned out to be good!!! Wild. Thanks for a great one, Opal! A sweet and sour tuna mixture served on a bed of chow mein noodles. Yum! In saucepan, combine ⅓ cup of reserved pineapple syrup with pineapple tidbits, green pepper strips, bullion cube and water. Heat to boiling. Simmer 5 mins. 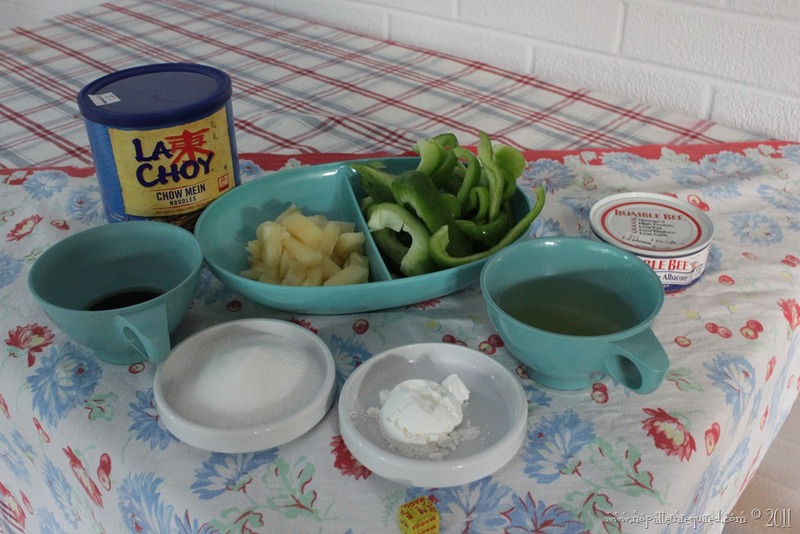 Mix together sugar, cornstarch, remaining pineapple syrup, vinegar and soy sauce. Add to pineapple mixture. Cook and stir until mixture thickens and bubbles. Add drained tuna and butter. Heat through. Serve over chow mein noodles. Wait. What? Why are you still here? Aren’t you supposed to be working or something? Did your husband go to MIT? Both my wife and I did. There must be something about the scientific mindset that makes one willing to try these bizarre old recipes. Who knew that tuna could be such a miracle worker! I still have never tasted tuna but the smell of it alone makes it incredibly hard to believe. Y’all tired of tuna yet? I have used Chow Mein noodles instead of rice. It was my last post! Odd that we both did Chow Mein recipes at the same time. Spooky. Oooooooooo!!! Are you getting chills! Holy tuna cakes!!! 🙂 This recipe is good too! That is just crazy-nuts! 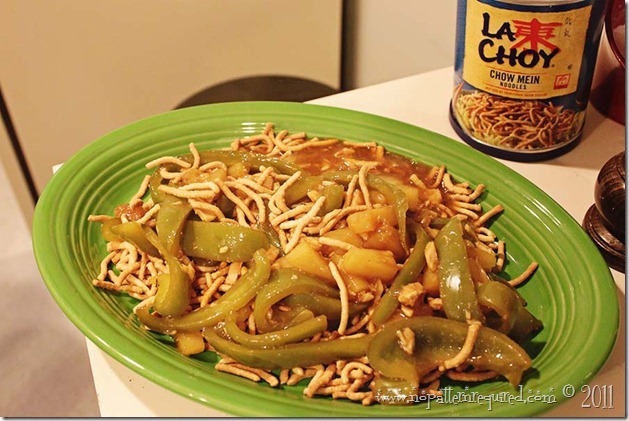 I am going to have to try the chow mein instead of rice thing, it sounds super good! 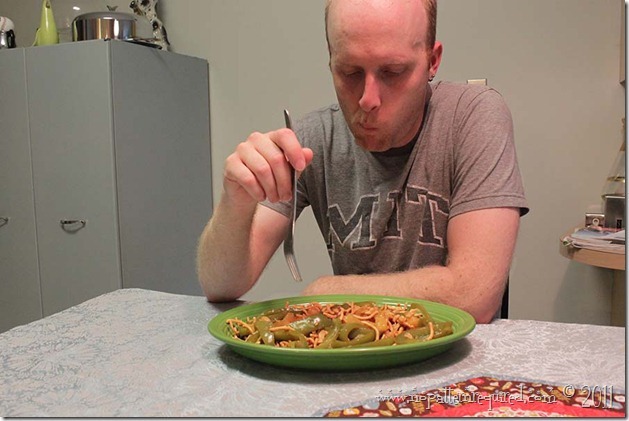 I remember having stir fry over chow mien noodles all the time as a kid. I loved it! Tom’s facial expressions are the best ever. At least one of those pictures needs to go on your Christmas cards. I am utterly baffled as to how that was tasty! However, you made it, and you’re not even sure why it’s tasty, LOL. So are you and Tom going to be taking a very very LONG hiatus from tuna soon? I imagine you must be more than sick of it, LOL! Just the other day I picked up those noodles from Wegman’s. When I saw them I just had to get them (There’s a lacking of Chinese food here in central PA) Of course, I didn’t know what the heck I was going to do with them. Now, at least I have food for thought. Thanks for sharing, Ruth. I am stretching my budget, and looking at my cans of tuna. I wanted to cook something retro, so I picked up my ancient hand-me-down copy of that red & white checkered cookbook (1973) and saw this recipe… and I knew… just knew.. that people had tried this before me. It’s new for me. I am intrigued, and adding this to my shopping list. 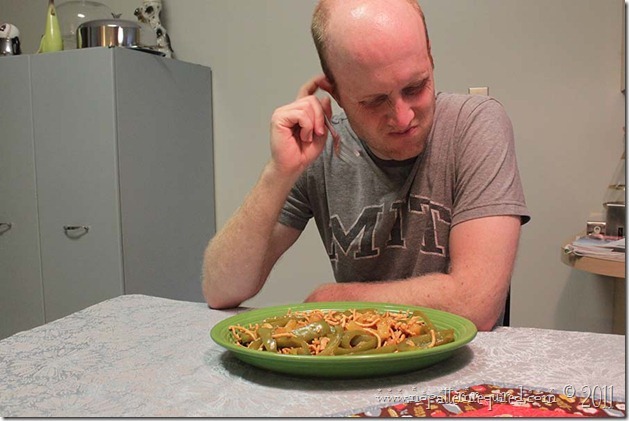 Here’s hoping I can actually find those fried chow mein noodles! I guess you didn’t grow up in the Midwest in the 70s. 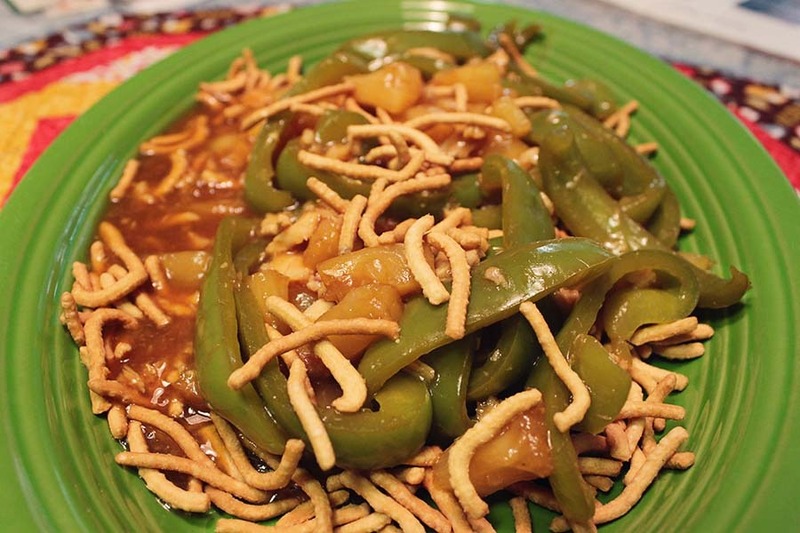 Otherwise, the idea of “Chinese food” served on a bed of chow-mein noodles would seem completely normal. You opened up the can of Chung King sludge, and dumped it on top. In fact, that’s what I grew up thinking “Oriental food” (as it was called in Ohio back then…and sometimes still is…) was supposed to be!